Are you in the market for a new estate? Top Ten Real Estate Deals website is featuring the top ten haunted homes for sale in the U.S. The home that Ozzie and Harriet once shared and was the set for The Adventures of Ozzie and Harriet from, 1952 to 1966 is available for $4.25 million. The 1916 5,813sf home sits on a half-acre, with five bedrooms and four baths. The house that is gated and located on a private cul-de-sac is known to be haunted by the couple. Mike Tyson’s former Ohio mansion has been abandoned since the 90s and for sale at $1.3 million. An indoor swimming pool, massive living room, and tiger cages are all included in the 60-acre five bedroom 7.5 baths home. A 16-year-old vacant unfinished LA home located on top of an Indian burial ground is for sale listed at $15.2 million. Gangs, addicts and Satanists was said to have entered the home, once even becoming a storyline on a “Law and Order” episode. The 9,800sf house has five bedrooms, seven baths, 200-bottle wine cellar, six-car garage, stone floors, pool and Jacuzzi. Abolitionist, John Brown died in 1859, 30 years later a grand Victorian home was built on the same site of the hanging. The four-story, 7,037sf Charles Town, W.Va $1.2 million home has five bedrooms, five bath and is located in the one of the most historic parts of town. An evil clown haunted house is for sale listed at, $130,000. Texas-based Hauntrepreneurs, a broker for used Halloween attractions, rents and sells mobile haunted houses and equipment. For a little under $4 million you can own the former house of Psycho star Janet Leigh. The 4,432sf home has four bedrooms, 4.5 baths, pool, tennis courts and sits on just over a half acre. America’s scariest haunted house located in Olean, N.Y is well-known to paranormal investigators across the country and can be yours for $289,000. 12 or more not-so-friendly ghosts have been known to frequent the house. At those prices it is no wonder the houses are haunted...ghosts are the only ones who can afford to live in them. Tha house in Lexington sounds kind of reasonable. But it's pretty small. 1150 square feet? i think my dog house is bigger than that. Most U.S. states require sellers to fill out a standard form disclosing what they know about the property’s condition and list any potential physical defects. This is a relatively recent reverse of the older “buyer beware” norm in real estate and lets buyers know ahead of time of any major problems with their dream home. A “scary-*bleep* haunted house” for sale in Rosemont is gaining some notoriety on Reddit as the building’s gloomy wallpaper, dark wood and faded crosses could host a remake of the Addam’s Family. The four-bedroom unit at 6878 St-Denis St. is currently selling for $715,000. The building, erected in 1920, was probably the first Victorian put up in the neighbourhood according to Asselin—and the only one not to see any renovations. The faded cross-shape over the bed in the master bedroom is an added touch. With flaking paint and swollen walls whoever buys the “haunted” property might be taking on a project, but the macabre interior is probably unique in the city. Oh gosh, so many thoughts come flooding in seeing the photos (must see). It is being sold by Christies too! Wow. Hard to imagine such a home has been long forgotten as it is and still exists. Like a pressed rose found in a book of a long past fond memory. In that neighborhood? The price is exorbitant in my opinion. But it does show old workmanship not seen today (I guess so!). Let some eccentric millionaire buy it and scare themselves. The old cellar reminds me of my grandma's old house. She lived in an old Victorian too. Yet, I remember fond happy memories. Locked in time. I can see several things as my imagination goes and goes. A mere cheap budget reality ghost hunter show? No way! I can see a movie here. It doesn't look like anyone has been living in this house for decades at least. Lost in some property portfolio dusty file way in the back of the file drawer. Several properties in an estate sale? Locked in time, like a wealthy son or daughter after their parents died - just closed the house and left it untouched. Like sadly when a child dies, the parents keep the cild's bedroom the same untouched basically forever. Wonderful place to visit, but i would not want to sleep overnight there. I could see structural problems already - in the cellar, the interior doorways. I can see in the entrance way if structurally possible, opening up the entrance way ceiling to create more vertical space and add windows for the natural light. The wood paneling looks remarkable and would need to be reused in the home. The house with its dark woods - I guess that was 'in' then. How times have changed, and perhaps people too. Can't imagine what the kitchen and bathrooms must be like. Iron rusty pipes - a water hand pump in the kitchen? Imagine the city codes now it would need to comply with. They did not show these. I had to makes copies of the all the photos and info, just to have a file called 'a haunted house'. Wow. It just reeks with atmosphere. I wonder what it's current spirit residents would think of my remodeling suggestions? Hummmmm. Is it really haunted (any reports)? Or do the photos and our imaginations just suggest it is? Oh, WOW!! That is so cool!! I hadn't even looked at the photos until Steve started talking about them. I bet the furniture and the wood paneling by themselves would be worth that price. I could do without the outside of it though. It just looks like some old worn out brick building on the outside but the insides are amazing! I bet the people living in that neighborhood don't have a clue what is in there neither. If they did I guarantee all of that furniture would be gone. I would love to live in a haunted house...especially one that looked like the inside of that one. Unfortunately, I don't have an extra $715,000 falling out of my pocket. I wold love to live in a haunted house too but I don't have anywhere near that much money. I'm always broke. That is a nice house tho. How old is it? Did it say? I didn't see anything about the ghosts either.If it is a haunted house why don't they talk about the ghosts? Will you find it delightfully unlivable in this ghostly retreat? A nearly 10,000-square-foot replica of the Disneyland Haunted Mansion attraction can be yours if the price is right, ghosts not included. Posted Wednesday on eBay, the four-story Georgia home includes a “hitchhiking ghost” surprise in a first-floor bathroom, as well as white pillars and iron railings on the home’s porch modeled on the popular attraction. A welcome plaque greets visitors at the front gate identical to the Disneyland attraction. Mark Hurt, a contractor who has worked with Disney theme parks building animatronics through his company Constructioneer, designed the home in 1996 in the quiet, gated community of Duluth, Ga. Inspired by the work of Walt Disney, Hurt was compelled to model his home after Disneyland’s Haunted Mansion Attraction, which was one of the last works Walt envisioned before his death in 1966. A few years later, in 1969, the New Orleans Square Haunted Mansion opened its doors in the Anaheim, Calif., park, 14 years after Disneyland opened. The Haunted Mansion was then built in Orlando’s Disney World, as well in Disney theme parks throughout the world. The appeal of the outdoor décor, as well as the haunting ghostly theme, attracted Hurt to dream up his own Haunted Mansion replica. Using his connections at Disney, Hurt was able to do a walk-around of the mansion, recording exact dimensions and elements from the original attraction. He even found the actual foundry that Walt Disney used to make the iron details, and welded it all to his home. He built in flickering lights and a reflection mirror in one of the six bathrooms, which sure gives unsuspecting guests the spooks. Everything else in the seven-bedroom, six-bathroom home was added to make the home more suitable for everyday living. Throughout the 16 years that homeowner Hurt, his wife and son lived in the residence, he has thrown numerous parties and hosted two weddings. But in all the time he lived in his dream-turned-reality Mansion, he never had the “haunted” experience that attracts visitors. Built in 1901, this Victorian home in the Hollywood section of Dunmore, PA features 1850 sf of living space with an additional 1350 sf of partially finished space. Original hardwood floors throughout entire home. 4 bedrooms, 2.5 bathrooms. Off-street parking. Freshly painted. New moulding throughout entire first floor. Slightly haunted. Nothing serious, though. e.g. The sounds of phantom footsteps. A strange knocking sound followed by a very quiet (hardly noticeable, even) scream at 3:13am, maybe once a week. Twice a week, tops. And the occasional ghastly visage lurking behind you in the bathroom mirror. Even still, this occurs very rarely and only in the second floor bathroom. Large living room with an open staircase, stained glass window and a large picture window. Large dining room with bay windows. A study/library with another stained glass window and a secret door behind a moving bookcase which leads into a small office. Kitchen features gas stove top, built-in oven and built-in dishwasher, tile counter top. Stairs leading to basement and a rear staircase leading upstairs. Also has enclosed porch/mudroom. Full 1st floor bath, very nice tile work and fixtures. 9 foot ceilings throughout 1st floor. 4 bedrooms. The 2 front bedrooms are separated by double louvered doors. Perfect for a Master Bedroom/Nursery set-up. 3 tall windows in each of the 4 bedrooms. Huge 2nd Floor full bath with large Victorian bathtub and very large closet. Large unfinished crawl space behind concealed door hidden in bedroom closet. Very strange area, but perfect for storage. Rear stairs leading down to kitchen. Stairs leading up to huge attic. Basement features very large wet bar. Has sink and built-in tap system. Very large space and high ceilings. Basement has nice layout and can also be converted into living space. Also features a half bath. All around a beautiful home with lots of updates and tons of charm. Must see. 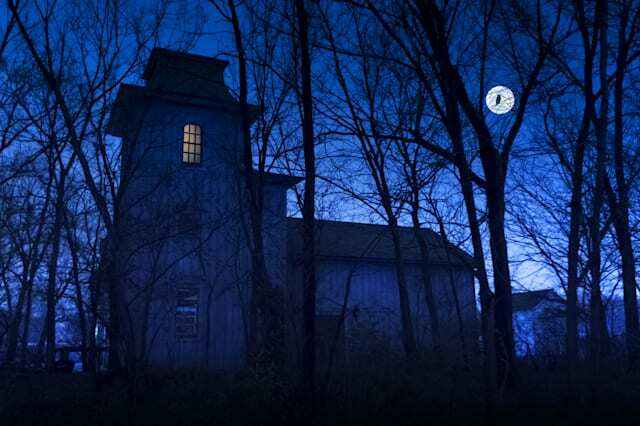 this dark scary haunted... Shutterstock"Haunted" properties fall within the category of stigmatized properties. Well, it's October already and Halloween decorations are already starting to surface. Haunted houses are fun to visit but most people wouldn't want to live in one, right? So that raises a "spooky" legal question. Do real estate brokers or sellers have a legal duty to inform purchasers if houses are truly haunted -- i.e, have been the site of a murder, suicide or paranormal activity? Disclosing that a house has a haunted history may be the most prudent course of action. value. Among the situations covered under the title of stigmatized is a property that was the site of a murder, suicide, alleged haunting, or other parapsychological phenomenon. About half of U.S. states have laws that deal with stigmatized properties, but most don't require sellers to disclose if they believe they have a ghost. For example, under Massachusetts law, real estate brokers and sellers are under no legal obligation to disclose that a property was the site of a felony, suicide or homicide, or has been the site of an alleged "parapsychological or supernatural phenomenon." Despite any law not requiring disclosure however, disclosing that a house has a haunted history may be the most prudent course of action. It's surely something many buyers would like to know beforehand. If a seller doesn't disclose, and the buyers find out about the property's history prior to the closing, there's a chance they would try to get out of the deal. There is a well-publicized case out of New York in the 1990s where a court allowed a buyer to terminate a real estate deal due to the failure to disclose "haunted" activity. As I always recommend in this digital era, an easy way to determine whether a house is truly "haunted" is to Google the property address and see what comes up. If there was a murder or suicide, it should reveal itself. Also, talk to the neighbors. They will surely know the property's history. If all else fails, of course you can always hire Ghostbusters. Happy house "haunting"! 'Tis the season for haunted houses, and this house -- which recently sold for the whopping sum of $1 -- at least looks downright spine-tingling, even if no ghosts actually reside there. Known as the Ouerbacker-Clement House, this Romanesque-style mansion was built for a prominent coffee merchant named Samuel Ouerbacker in the late 19th century in the once-fashionable Russell neighborhood of Louisville, Kentucky. Over the years it was eventually transformed into the offices of a tax business, before it was ironically taken over by the city in 2005 because of unpaid taxes, according to the Courier-Journal. But earlier this year, the bank once again sold the property for $1 to Oracle Design, which wants to restore the mansion and turn it into apartments. According to the Courier-Journal, a representative for Oracle said that the Ouerbacker-Clement House is among 14 residential properties in Louisville that the firm is targeting for a historic residential rehabilitation project. The notorious Long Island home which served as the basis for the 'Amityville Horror' story may soon have new owners as it is up for sale once again. The seemingly innocent abode earned worldwide infamy after a series of events that began when Ronald DeFeo Jr. murdered six of his family members at the home in 1974. Although the Lutzes only lived in the home for a mere 28 days, their incredible story left the location with a lasting reputation which has persisted for decades, much to the dismay of Amityville residents. "The house is haunted, yes, but not by who you think. It's haunted by the curiosity seekers that make it difficult for the people that live there," Amityville real estate agent Joanne Mills told ABC News. Mills marveled that when ownership of the home changed hands in 1997, it was a relatively quiet transaction, but became a massive news story when it was sold once again in 2010. It appears that anyone who purchases the home must be prepared to deal with people visiting the town and attempting to get a glimpse of the house that inspired the 'Amityville Horror' phenomenon. In fact, Mills has been forced to take drastic measures as she attempts to broker the sale of the home in 2016, requiring prospective buyers to prove they have the $850,000 to buy the house before she will even show it to them. And, as one might expect, the traditional real estate practice of holding an open house is off the table for the Amityville home, lest the location become overrun with ghost hunters and other thrill seekers. Regardless of who ultimately purchases the house in this latest sale, history suggests it will only be a few years before the building is back on the market again. That is, of course, unless an enterprising paranormal enthusiast purchases the home and takes advantage of its name value by opening the infamous site up the public. Coast Insiders looking for a unique perspective on the Amityville Horror case can check out Dave Schrader's 10/25/2013 conversation with Christopher Lutz, who recounted living through the legendary paranormal tale. Nothin' could be any worst than the one I live in now. You think your house is haunted and you want out. Maybe your house even has a scary phantom voice that is telling you to get out. Either way, you are probably concerned that it will be difficult to sell a house that is haunted. Thankfully, you are in luck. Realtor.com has recently conducted a survey that should help you and your real estate professional come up with a strategy that will get you top dollar for your cursed listing. Awhile back I was curious whether sellers were required to notify interested buyers if their house is haunted. What I found was that it is debatable. According to Arizona law, where I practice real estate, you need to disclose material facts, or any information that may effect the value of the home. If the house is haunted, it may not be an ideal place to live, but then again, some of you may be screaming at the computer screen, “Ghosts are not real!” Good point. It would be difficult to prove whether a home is haunted. That being the case, if you believe it is, and you have shared that belief, especially publicly, you should probably disclose it. The term I have heard some use is to disclose if the house is “notoriously haunted.” I love that term. In my previous article, I wrote about how a seller in New York got sued and lost because she had talked to the media about her house being haunted, but did not disclose it when she sold the home. Her house was notoriously haunted by her own doing, but it is still a subjective term. For this reason, in my previous article, I recommended disclosure. I recently got feedback from fellow real estate agents on this topic, and one salesperson told me she and her broker currently have a listing they decided to disclose is haunted. They felt it was better to be safe than sorry. Of course, their concern now is whether it will have a negative effect on the sale. Another great haunted real estate story I got was from an agent in my brokerage. She says she sold a home in which two men had died on two separate occasions in the home’s history. They did not disclose this, and, at least in Arizona, deaths in the house do not have to be disclosed. The house was sold, and sometime had passed when she received a call from the buyer’s agent. The agent asked if she knew about anything that had happened in the home because one of the new residents was seeing a man outside of her window at night! Queue scary shriek sound effect! AHHHH! Had they known, or believed, their house was haunted by a man who had died there in the past and had disclosed that, does not necessarily mean they would not have found a buyer. Another agent responded he had sold an alleged haunted house to a local occult bookstore owner who is very happy with the haunted home. That is a win-win situation if I’ve ever heard one, but there are only so many occult bookstore owners to go around. For the rest of us, we may need to work with our real estate agent to come up with a strategy, and according to some new info from Realtor.com, your real estate agent may need to do some wheeling and dealing, but selling your haunted house can be done. Out of 1000 people surveyed, 33% said they are OK living in a haunted house. This is good and bad. It shows that there are buyers out there for your haunted house, but not as many as for a non-haunted one. This is surprising given that many people do not believe in ghosts, but even if you do not think there really are such things as ghost, if someone says a house is haunted, why risk it, right? 25% of those surveyed said they might live in a haunted house and 42% said no way. John Edmonds moved onto the ranch in 1997. That’s when things got weird. What is it with aliens and the desert? The realtor listing for the Stardust Ranch in Buckeye, Arizona might at first appear to be your run-of-the-mill $5 million, 10-acre ranch, but in reality the place may be one of the world’s most active sites of alien visitation and paranormal happenings. According to owners John and Joyce Edmonds, the weirdness began right when they moved in as they found all of the previous owner’s possessions at the bottom of their swimming pool. Shortly after, a machete-wielding man reportedly showed up to welcome them – and let them know that he was in charge of keeping the monsters away. What monsters, you ask? Why, aliens, of course. What else? The Stardust Ranch is no stranger to press coverage about the high strangeness that allegedly occurs frequently on the property. The ranch has been featured on the Travel Channel and pops up from time to time in the weird news blogosphere. The ranch’s owner, John Edmonds, claims that there are two interdimensional portals on the grounds through which alien beings frequently travel. Edmonds reportedly keeps a samurai sword above his fireplace to fend off these interdimensional beings and claims he has slain 18 of them himself. The couple says they frequently find unexplained bruises and syringe marks on their bodies, believing them to be the work of aliens who regularly abduct them for experimentation. Animals have been also allegedly found mutilated on the property. This property’s not going to be for the faint of heart. It’s going to be for someone who has a true interest in the paranormal and aliens and isn’t afraid to live with them. And it wouldn’t hurt if they had an interest in horses, too. Buy at your own risk. If it happens, it happens—but if it doesn’t, it’s not on [the Edmonds]. But I don’t think you’re going to find another property quite like this one. That’s for sure: it’s got 10 acres, 3,500 square feet, a pool, RV hookups, five bedrooms, and four baths – for only $5 million! Who cares about alien abductors stabbing you with needles in the night? As long as they wipe their feet and don’t track any of that pesky Arizona dust all over the place, they’re fine in my book. It’s time for another edition of “Flip This Haunted House!” Our latest poltergeist palace screaming “Location, location, location of ghosts!” is the Charming Forge Mansion in Womelsdorf, Pennsylvania, with seven bedrooms, four bathrooms and a load of ghosts, including a grieving lover, Revolutionary War POWs and Native Americans from a graveyard under the foundation. Is it a horror-filled steal at $825,000? The real estate listing tells you everything you need to know about the physical structure, 48-acre property and historical significance of the Charming Forge Mansion, which is truly in “museum quality” condition (as seen in the pictures) due to an extensive renovation and upgrade in 1994 and explains why realtors are promoting it as the perfect place for a large family or those interested in the history of this area between Harrisburg and Philadelphia. Or for those interested in ghosts, either for fun or profit. Charles J. Adams III, a Pennsylvania ghosthunter and author, wrote in the Reading Eagle of many of the apparitions associated with the Charming Forge Mansion. Baron Stiegel died there and has been seen in the halls. The most famous tale involves Col. George Ege, an early owner of both the forge and the mansion, who banished a male employee who pined for Ege’s young female ward. The young man returned years later and, while waving to his beloved, fell off of his horse and died, possibly with the reins twisted around his neck so tightly that he was decapitated. That would explain the headless horseman seen riding on the grounds and the presence felt in the girl’s room. Then there’s the graveyard. It’s believed that a Native American warned Stieger not to build the forge on the Native American graveyard. When Stieger refused, he allegedly placed a “Black Eagle” curse on Charming Forge, and was then killed by a piece of ironmaking equipment. Needless to say, his ghost also haunts the grounds and bones were indeed found there during excavations. If potential buyers hear the sounds of marching, that could be some German POWs captured during the American Revolutionary War and held there, although it’s not known why their spirits may have stuck around. As expected of someone hoping to get the best price, the current owner claims to have had no ghostly encounters, but some guests have, prompting listing agent Matt Barnhart to make sure buyers who may want ghosts aren’t discouraged.